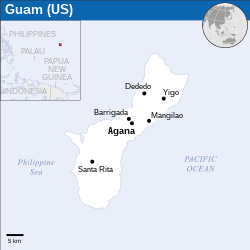 Guam (Chamorro: Guåhåncode: cha promotit tae code: ch ; formally the Territory o Guam) is an unincorporatit an organised territory o the Unitit States. ↑ 1.0 1.1 1.2 1.3 1.4 "Australia-Oceania :: Guam (Territory of the US)". The World Factbook. Central Intelligence Agency. Retrieved 26 August 2015. This page wis last eeditit on 30 August 2018, at 11:24.